Sometimes you just need a gooey, chocolatey dessert and this one fits the bill perfectly! Preheat oven to 350°F and lightly grease a 9 x 13 inch baking pan. In a medium saucepan, melt the butter over medium heat. Add the cocoa to the saucepan and stir; remove saucepan from heat. Pour melted butter mixture into a mixing bowl and add sugar and eggs, mix until blended. Add the vanilla, then mix in the flour and salt. Stir in the pecans. Pour batter into prepared pan and cook for 33-35 minutes or until done. Remove pan from oven and sprinkle with marshmallows and let cake cool for about 1 hour. Combine all of the frosting ingredients and mix until smooth. Spread frosting on cooled cake. If your frosting is too thick, add more milk. 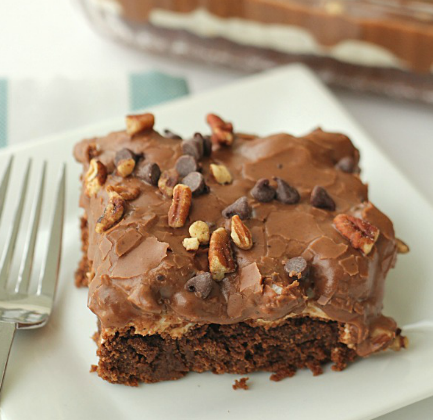 Sprinkle pecans and chocolate chips on top of frosting and enjoy! Definitely “death by chocolate” and i love chocolate. ? I’d put in maybe only 1/4 cup of cocoa rather than 1/3. The marshmellows make it hard to cut through And only cut very small pieces. You’ll definitely need a tall glass of milk to go with!